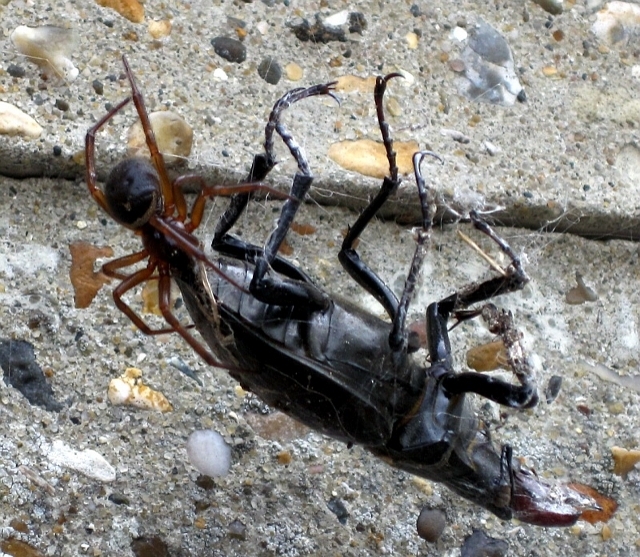 Not many people would associate spiders with stag beetle predators in the UK. But things are changing and due to the expansion of some false widow spiders some people are finding stag beetles entangled in their webs. Some of these encounters are fatal. According to Dr. Stuart Hine, their webs are characteristically strong and can easily ensnare an insect as large as a stag beetle. The spiders also rapidly fix their prey to the web by spinning silk directly to them as they struggle. At the same time, they inject venom into the soft joints of the legs to further immobilise them. Below is a photo of a false widow spider (Steatoda nobilis) perhaps ready to start feeding from a trussed up male stag beetle. It is a huge meal capable of keeping the spider sated for quite a while. Steatoda nobilis preying on a male Lucanus cervus. Photo courtesy of London Natural History Museum, July 2012. Location? This particular false widow spider (S. nobilis) prefers to hunt high above the ground in garden buildings; it has a preference for conservatories, greenhouses and even a Wendy house (toy house for children), see below. Photo courtesy of Alejandra Lopez; 12 June 2014, New Milton, Hampshire. This male was already dead when he was discovered, unfortunately. There is a stag beetle nest nearby and after they emerge, adults are often found inside this Wendy house. Note the characteristic tangle of threads in that corner. For a video clip taken in that Wendy house of an engorged S. nobilis and its amazing scaffold, click here. Coincidentally, also in 2014 a female stag beetle was found suspended in a garden spider web. She was trying to fly away. See below and note the mites on the right hard wing. Video by Gavin Peters; 21 June 2014, East Bromley, London. The female was rescued in time, but the spider was never found. Most spiders are very shy and prefer to hunt during the night. There is another false widow spider, S. grossa, which is also capable of catching large insects. This species hunts much lower down; it spins their strong webs close to the ground. Dr. Stuart Hine has seen several stag beetle (L. cervus) females caught in their webs and the sated spiders absolutely engorged after such a huge meal. Do keep an eye in your garden, particularly if you live in the South of the UK, where these spiders have a good stronghold and take some pictures! They are not that common and it would be nice to show some more here. If you want to share them, then contact me.